Are You Familiar With The Long Tail? An introduction to the Long Tail. The Internet, and Technology, are changing the face of the World’s Economies. While Big Business, with it’s deep pockets, has traditionally dominated practically every industry, Small Business has always been a valuable - and essential - component of a Democratic Nation’s Economic System. However, a major barrier to starting and establishing a business, has been the financial cost of entry, and staying afloat until profitable. Startups are notorious money pits, and for this, and many other reasons, most fail. The above scenario is undergoing not merely a change . . .
Technology is placing the tools of production in the hands of anyone capable of using them . . . These tools will eventually enable individuals and groups to cooperate and collaborate to produce everything and anything. From down-loadable Digitized Products to 3D printed Physical Goods of every description. That is worth repeating, every description. The Internet is placing in those same hands the means of distribution of an exponentially growing abundance of Goods and Services on a scale, and production cost, that the protagonists of even the largest Companies could previously only day dream about. While this eventual Digital World is still a way off, the distribution channels and tools of the first stage of this fundamental shift are now available to anyone with a computer, an Internet connection, and the desire and ability to employ them. We are living on the ground floor of what was once the domain of Science Fiction. We are pioneers on a digital front. The first stage of this fundamental shift - dubbed The Long Tail - is already well under way, and our interest here is what this shift means to you - and me - as a Solopreneur. In the commercial sense, this phenomenon is a concept describing the direction business has for some time been, and still is, trending. A concept originally perceived by Chris Anderson, former Editor in Chief of Wired Magazine, best selling Author, and active entrepreneur. He is currently living his dream as founding CEO of 3DR.com, an entrepreneurial company in the Robotics field. 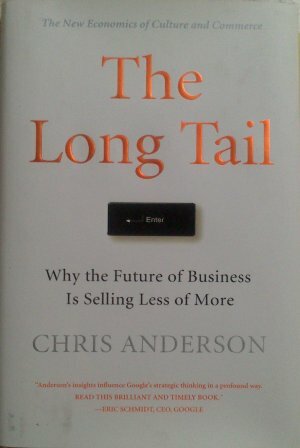 In 2006 Chris published a book entitled “The Long Tail”, subtitling it “Why The Future Of Business Is Selling Less Of More”. And every time you see or recall this title . . . Being the idea specialist, the concept of selling less of more makes perfect sense for a solopreneur. The intervening decade since publication of his book has served to vindicate Chris Anderson’s prophetic writings, culminating in, to use his own words, thousands of millions of opportunities. One need not be a prophet today to predict that this trend will not only continue, but continue unabated, and exponentially. That fact is becoming joyfully ever more obvious. Additionally, in a reassuring manner, author Chris Anderson dispels any notion that this remarkable development is merely unsaleable rubbish - Of course it contains a percentage of rubbish - so too does the Short Head - As in all Human endeavor this is par for the course. The Long Tail tells the story of how, before the Digital Age, we were limited in pretty much every thing we attempted to market, and innovative marketers responses to these limitations. This refers to variety, and distribution, not necessarily quantity, although that too is affected. This fascinating phenomenon consists of a body with a “Short Head” wherein reside the major brands and companies we are all familiar with. The brands that seemingly generate huge sales of “popular” merchandise with few competitors - mainly because of limited shelf space and huge production costs. And a “Long Tail” wherein exists every other commercial thing. This tail theoretically extends infinitely, and possesses power the short head simply cannot match, as this experience with my graphics card cooling fan demonstrates. The contents of the long tail are an inestimable multiple of the contents of the short head. Valuable content worth an equivalent inestimable sum. And of utmost significance, Valuable Content never to be available in the short head. This availability could apply to my recently purchased cooling fan, Great Grandma’s roast chicken recipe and the necessary ingredients, an exhaust valve for a 1906 Ford Model T, or a zillion other things, either existing, or yet to be created because of the opportunity the long tail offers. Shopping has become - potentially - evermore satisfying! The Internet provides ready, effective, efficient distribution channels, the ability to bring buyer and seller together regardless of their geographic locations, and limitless shelf space for digital goods. Digital tools allow production of digital goods in any quantity imaginable, in particular making short runs profitable, and consumer choice infinite. The world Wide Web facilitates massively increased shelf space for physical goods, hosted by solopreneurs, again, making short runs of product profitable. These short run producers are then aggregated by Master Websites that seamlessly tie everything together by providing the tools to do so. This marvelous combination is offering a prosperous future to any one willing to initiate, and continue, the effort to make it work for them. All at an immensely reduced cost quite unfathomable a mere decade ago. Solo Build It! is constructed from the ground up to take full advantage of the long tail phenomenon - guiding you from idea to income. This video tour of Solo Build It! fills in the gaps.